USDCAD spent the first days of January in free fall and formed a low for the month at 1.3179 and is now looking to push off from this low. Currently, the market is moving between the 23.6% and 28.2% Fibonacci level of the January down leg. In the short term, the pair may recover to the 50% Fibonacci level (1.342) or even the 61.8% level (1.348). The MACD could cross its signal line and move the histogram into positive territory. 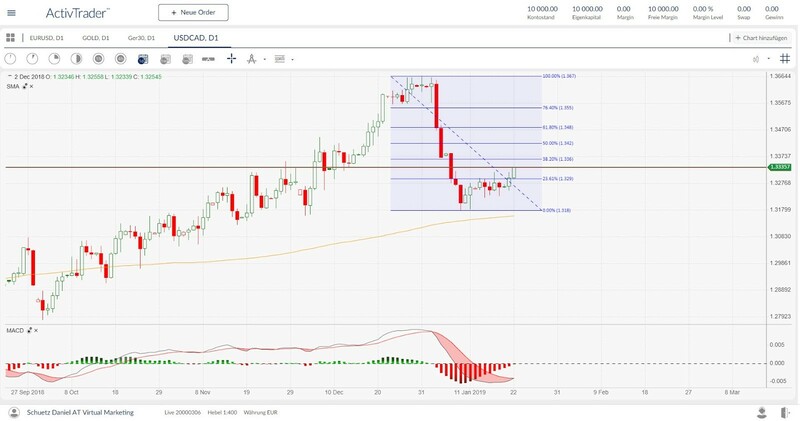 Should the market continue to improve, the first resistance should be between the highs from late June 2018 at 1.3385 and the 50% retracement of the downward movement at 1.342. In December 2018 this was an essential area for the bulls, at which the market stayed for a few days. If bulls are not impressed by the 50% retracement range instead, the next target could be 61.8% at 1.346 and then the round 1.360. Alternatively, if the bears take back the market, the range between the 38.2% Fibonacci of 1.336 and the 38.2% Fibonacci of 1.342 may prove to be a barrier. If this resistance holds and the market even falls below the low for the month, it must be seen whether the bears can currently break through the 200-day simple moving average at currently 1.3157. A final finish below this line could lead to a stronger drop, probably towards the August and October 2018 lows in the range of 1.299 to 1.296. In the medium term, the positive outlook has somewhat evaporated after the poor start in January and should become neutral if the range falls below 1.3159. However, the fact that the December low for the month has not yet been passed has had a positive effect here.